The University of Bologna is considered by historians to be the world’s oldest university in terms of continuous operation. At the university’s Centre for the History of Universities and Science, our research group works on different projects focused on understanding the history of this academic institution and its long-term socio-political relationships. Several sources and methods have been used for studying its past, from quantitative data analysis to online databases of scientific publications. Since the introduction of the World Wide Web, a new and different kind of primary source has become available for researchers: born digital documents, materials which have been shared primarily online and which will become increasingly useful for historians interested in studying recent history. However, these sources are already more difficult to preserve compared to traditional ones. And this is true especially for what concerns the University of Bologna’s digital past. In fact, Italy does not have a national archive for the preservation of its web-sphere and furthermore “Unibo.it” has been excluded from the Wayback Machine. For this reason, I have focused my research (a forthcoming piece on this will be available in Digital Humanities Quarterly) primarily on understanding how to deal and solve this specific issue in order to reconstruct the University of Bologna’s digital past and to understand if these materials are able to offer us a new perspective on the recent history of this institution. 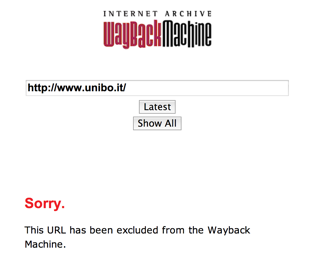 In order to understand the reasons of the removal of Unibo.it, my first step was to find, in the exclusion-policy of the Internet Archive, information related to the message “This URL has been excluded from the Wayback Machine”, which appeared when searching “http://www.unibo.it”. As described in the Internet Archive’s FAQ section, the most common reason for this exclusion is when a website explicitly requests to not be crawled by adding the string “User-agent: ia_archiver Disallow: /” to its robots.txt file. However, it is also explained that “Sometimes a website owner will contact us directly and ask us to stop crawling or archiving a site, and we endeavor to comply with these requests. When you come across a “blocked site error” message, that means that a site owner has made such a request and it has been honoured. Currently there is no way to exclude only a portion of a site, or to exclude archiving a site for a particular time period only. When a URL has been excluded at direct owner request from being archived, that exclusion is retroactive and permanent”. When a website has not been archived due to robots.txt limitations a specific message is displayed. This is different from the one that appeared when searching the University of Bologna website, as you can see in the figures below. 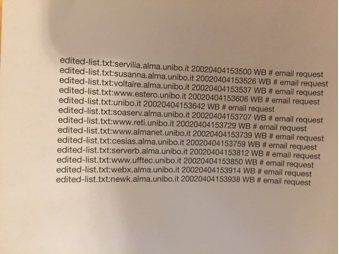 Therefore, the only possible conclusion is that someone explicitly requested to remove the University of Bologna website (or more likely, only a specific part of it) from the Internet Archive. For this reason, I decided to consult CeSIA, the team that has supervised Unibo.it during the last few years, regarding this issue. However, they did not submit any removal request to the Internet Archive and they were not aware of anyone submitting it. To clarify this issue and discover whether the website of this institution has been somehow preserved during the last twenty years, I further decided to contact the Internet Archive team at info@archive.org (as suggested in the FAQ section). Thanks to the efforts of Mauro Amico (CeSIA), Raffaele Messuti (AlmaDL – Unibo), Christopher Butler (Internet Archive) and Giovanni Damiola (Internet Archive), we began to collaborate at the end of March 2015. As Butler told us, this case was really similar to another one that involved the New York Government Websites. With their help, I discovered that a removal request regarding the main website and a list of specific subdomains had been submitted to the Wayback Machine in April 2002. With our efforts, the university main website became available again on the Wayback Machine on the 13th of April 2015. However, both the Internet Archive and CeSIA have no trace of the email requests. For this reason, CeSIA decided to keep the other URLs in the list excluded from the Wayback Machine for the moment, as it is possible that this request was made for a specific legal reason. In 2002 the administration of Unibo.it changed completely, during a general re-organization of the university’s digital presence. Therefore, it is entirely obscure who, in that very same month, could have sent this specific request, and for which reason. However, it is evident that this request was made by someone who knew how the Internet Archive exclusion policy works, as he/she explicitly declared a specific list of subdomains to remove (in fact, the Internet Archive excludes based on URLs and their subsections – not subdomains). It could be possible that the author obtained this specific knowledge by contacting directly the Internet Archive and asking for clarification. Even if thirteen years have passed, my assumption was that someone involved in the administration of the website would have remembered at least this email exchange with a team of digital archivists in San Francisco. So, between April and June 2015 I conducted a series of interviews with several of the people involved in the Unibo.it website, pre and post the 2002 reorganization. However, no one had memories or old emails related to this specific issue. As the specificity of the request is the only hint that could help me identify its author, I decided to analyze the different urls in more detail. The majority of them are server addresses (identified by “alma.unibo”), while the other pages are subdomains of the main website, for example estero.unibo.it (probably dedicated to international collaborations). My questions now are: why someone wanted to exclude exactly these pages and not all the department pages, which had an extremely active presence at that time? Why exactly these four subdomains and not the digital magazine Alma2000 (alma2000.unibo.it) or the e-learning platform (www.elearning.unibo.it)? It could be possible that this precise selection is related to a specific reason, that could offer us a better understanding on the use and the purpose of this platform in those years. To conclude, I would like to also point out how strange this specific impasse is: given that we don’t know the reason of the request I cannot have the permission from CeSIA, the current administrator, to analyze the snapshots of these URLs. However, at the same time, we are not able to find anyone who remembers sending the request and not a single proof of it has been preserved. In my opinion, this depicts perfectly a new level of difficulties that future historians will encounter while investigating our past in the archives. Federico Nanni is a PhD student in Science, Technology and Society at the Centre for the History of Universities and Science of the University of Bologna. His research is focused on understanding how to combine methodologies from different fields of study in order to face both the scarcity and the abundance of born digital sources related to the recent history of Italian universities. In the summer of 2014, I became interested in studying if it was more than my mere impression that websites were beginning to present less text to end-users. Websites such as Buzzfeed.com were gaining enormous popularity and using a communicative style that had more in common with children’s books (large graphics and short segments of text) than with the traditional newspaper column. I wondered if I could measure this change in any systematic way? I was interested in this change primarily for what it implied about literacy and what we ought to teach students, and more broadly about what this change meant for how humans communicate and share information, knowledge and culture. Teaching students to become archivists at a graduate school of information and library science, and focusing on a variety of digital archiving challenges, I was quite familiar with web archives. It was immediately clear to me if I were to study this issue I would be relying on web archives, and primarily on the Internet Archive’s Wayback Machine, since it had collected such a wide scope of web pages since the 1990s. 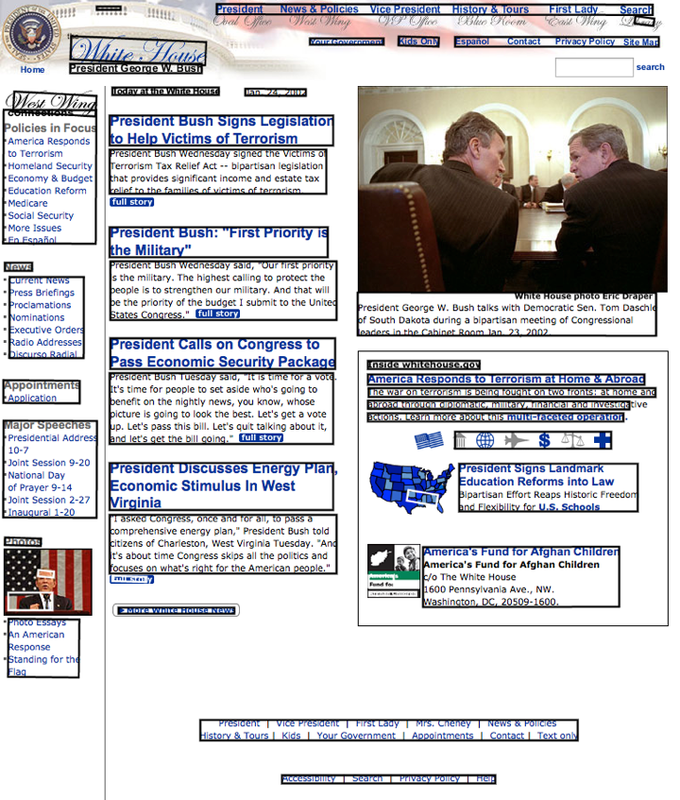 The method devised was to select 100 popular and prominent homepages in the United States from a variety of sectors that were present in the late 1990s and are still used today. I also decided to select homepages every three years beginning in 1999, resulting in 6 captures or 600 homepages. The reason for this decision is that by 1999 the Internet Archive’s web archiving efforts were fully underway, and three years would be enough to show changes but not require a hugely repetitive dataset. 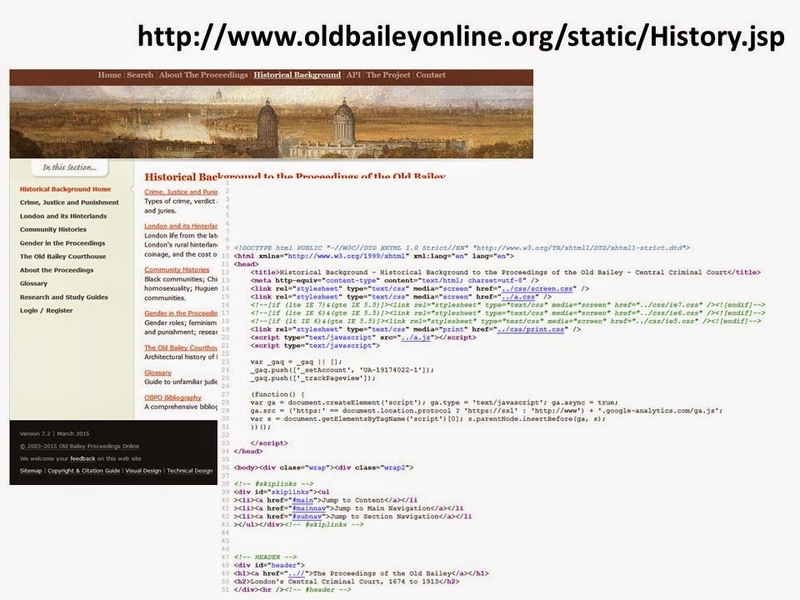 URLs for webpages in the Internet Archive were selected using the Memento web service. Full webpages were saved as static PNG files. To detect text blocks from non-text blocks, I modified a Firefox extension called Project Naptha. This extension detects text from non-text using an algorithm called the Stroke Width Transform. The percentage of text per webpage was calculated and stored in a database. A sample of detected text from non-text is shown in the figure below, which is 46.10% text. Once the percentage of text for each webpage and year were computed, I used a statistical technique called a one-way ANOVA to determine whether the percentage of text on a webpage was a chance occurrence, or instead dependent on the year the Website was produced. I found that these percentages were not random occurrences but dependent on the year of production (what we would call statistically significant). 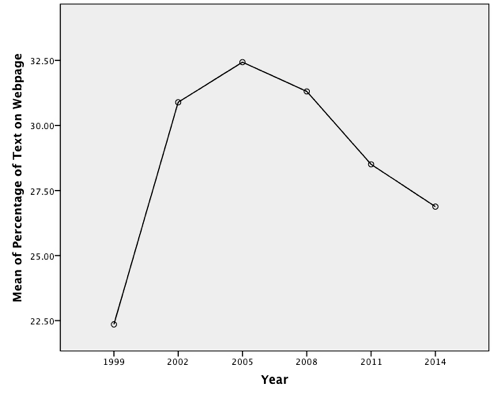 The major finding is that the amount of text rose each year from 1999 to 2005, at which point it peaked, and it has been on a decline ever since. Thus, website homepages in 2014 have 5.5% less text than they did in 2005. This is consistent with other research that uses web archives that indicate a decrease of text on the web. This pattern is illustrated below. This study necessarily begs the question: what has caused this decrease in the percentage of text on the Web? Although it is difficult to make definitive conclusions, one suggestion is that the first Web boom of the late 1990s and early 2000s brought about significant enhancements to internet infrastructure, allowing for non-textual media such as video to be more easily streamed to end-users (Interestingly, the year 2005 was also the year that YouTube was launched.) This is not to suggest that text was replaced with YouTube videos but rather that a rise in multiple modes of communication became more possible with their easier delivery, such as video and audio, which may have helped unseat text from its primacy on the World Wide Web. I think the study raises a number of interesting issues. If the World Wide Web is presenting less text to users relative to other elements, does this mean that the World Wide Web is becoming a place where deep reading is less likely to occur? Is deep reading now only happening in other places, such as e-readers or printed books (some research indicates this might be the case)? The early web was the great delivery mechanism of text, but might text be further unseated from its primacy and the web become primarily a platform for delivering audiovisual media? 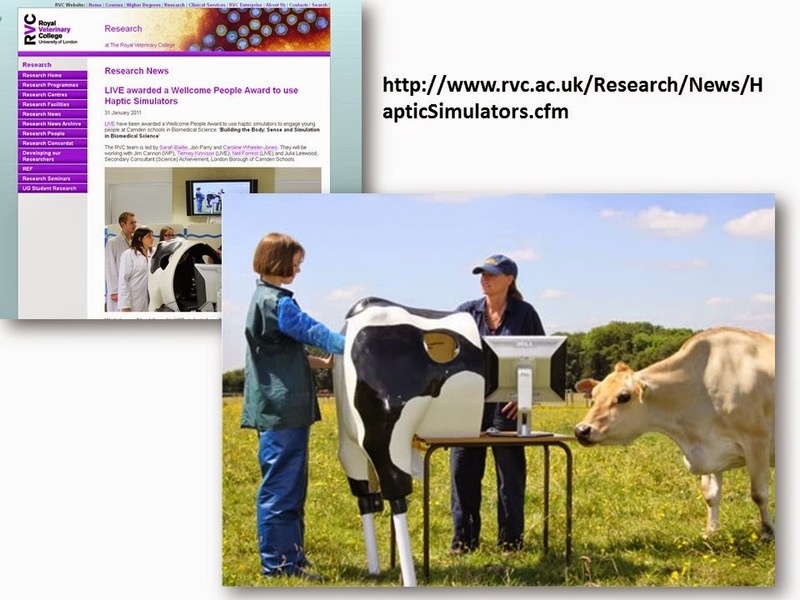 If interested in this study, you can read it on the open-access publication Information Research. One of the first things you need to get your head around when you dive into the history of the internet is that “the internet” and “the web” are not the same thing. That sounds trivial to most people who have worked in the sector for any period of time. But trust me – it isn’t. It’s a problem because we have been archiving the web systematically for quite a long time. The British Library’s archive has pages stored from 1996 onwards. So for someone relatively new to using web archives as a scholarly source, I can access a lot of information. As someone whose family got their first internet connection in 2000, however, I also know that there’s a lot that won’t be stored. And there is a lot that will be stored that I won’t be able to access. Internet Relay Chat, for example, was very popular when I first got access to the ‘net. From those MSN chat rooms (that were eventually shut down due to the… er… “unpleasantness”), to the use of purpose-made clients to connect with friends, chat was by its nature ephemeral. Perhaps some user would have kept a log of the conversation (and I probably have a few of those on text file somewhere). More than likely, they didn’t. Or even if they did, the chances of them surviving are slim. The advent of Facebook and Twitter and their ilk in the mid-2000s has also complicated matters. Pretty quickly it became apparent that these social networks were culturally important and would probably need to be preserved. But the ethics of such an undertaking are complicated to say the least. It’s one thing to do a “big data” analysis of the rise and fall of the term “hope” over the 2004 US General Election. It’s another to do a “close reading” analysis of the behaviour of teenagers. Since it’s all held behind password-protected pages and servers, our old web-crawling techniques aren’t going to help. The Library of Congress is collecting Twitter. But how we will actually use it in the future remains to be seen. This matters to me as a historian because I am not a computer scientist. I wouldn’t even consider myself a historian of the internet. Much like I use biographies, diaries, government papers and objects to build a story of the past, internet sources are yet another way of finding out what people said and did. A good historian would never assume a diary to be an accurate, objective account of past events. There is always an inherent bias in which data survive. Just as she would also understand that regardless of the amount of sources she collates, there will always be gaps in the evidence. The problem, really, is twofold. First, there is so much material available it gives both the illusion of completeness and the temptation to try to use it all. Second, because it lacks the human curation element so central to “traditional” archives, it can be difficult to sift through the white noise and home in on the data that matters to our research questions. The first part is relatively difficult to get over, but not impossible. It simply requires some discipline and better training on what internet archives can and cannot do. From there, we can apply our knowledge and discretion to only focus on the parts of the archive that will actually help us – and/or adapt our research questions accordingly. But that second bit is always going to be a problem. Again, discipline can help. We can simply accept our fate – that we will never have it all – and focus our histories on the scraps that remain. Like Ian Milligan’s work on the archive of GeoCities. Or Kevin Driscoll’s on the history of Bulletin Board Systems. At the same time, how does a historian of the 1990s try to use these archives to try to access the people of the period? How on earth can this material be narrowed down? Will we always have to keep our “online” and “offline” research separate? The exciting thing is that we don’t have fully developed answers to these questions yet. The scary thing is that it’s our generation of scholars that are going to have to come up with the solutions. This seems like a lot of work. If anyone is willing to do it for me, I would be forever grateful! Firstly, the copies held by the Internet Archive (archive.org) were not erased or deleted – all that happened is that access to the resources was blocked. Due to the legal environment in which the Internet Archive operates, they have adopted a policy that allows web sites to use robots.txt to directly control whether the archived copies can be made available. The robots.txt protocol has no legal force but the observance of it is part of good manners in interaction online. It requests that search engines and other web crawlers such as those used by web archives do not visit or index the page. The Internet Archive policy extends the same courtesy to playback. At some point after the content in question was removed from the original website, the party added the content in question to their robots.txt file. As the practice of the Internet Archive is to observe robots.txt retrospectively, it began to withhold its copies, which had been made before the party implemented robots.txt on the archive of speeches. Since then, the party has reversed that decision, and the Internet Archive copies are live once again. As public engagement lead for the UK Web Archive at the time, I was happily able to use the episode to draw attention to holdings of the same content in UKWA that were not retrospectively affected by a change to the robots.txt of the original site. This week I’ve been prompted to think about another aspect of this issue by my own research. I’ve had occasion to spend some time looking at archived content from a political organisation in the UK, the values of which I deplore but which as scholars we need to understand. The UK Web Archive holds some data from this particular domain, but only back to 2005, and the earlier content is only available in the Internet Archive. Some time ago I mused on a possible ‘Heisenberg principle of web archiving‘ – the idea that, as public consciousness of web archiving steadily grows, the consciousness of that fact begins to affect the behaviour of the live web. In 2012 it was hard to see how we might observe any such trend, and I don’t think we’re any closer to being able to do so. But the Conservative party episode highlights the vulnerability of content in the Internet Archive to a change in robots.txt policy by an organisation with something to hide and a new-found understanding of how web archiving works. Put simply: the content I’ve been citing this week could later today disappear from view if the organisation concerned wanted it to, and was to come to understand how to make it happen. It is possible, in short, effectively to delete the archive – which is rather terrifying. In the UK, at least, the danger of this is removed for content published after 2013, due to the provisions of Non-Print Legal Deposit. (And this is yet another argument for legal deposit provisions in every jurisdiction worldwide). In the meantime, as scholars, we are left with the uneasy awareness that the more we draw attention to the archive, the greater the danger to which it is exposed. Have Web Collections? 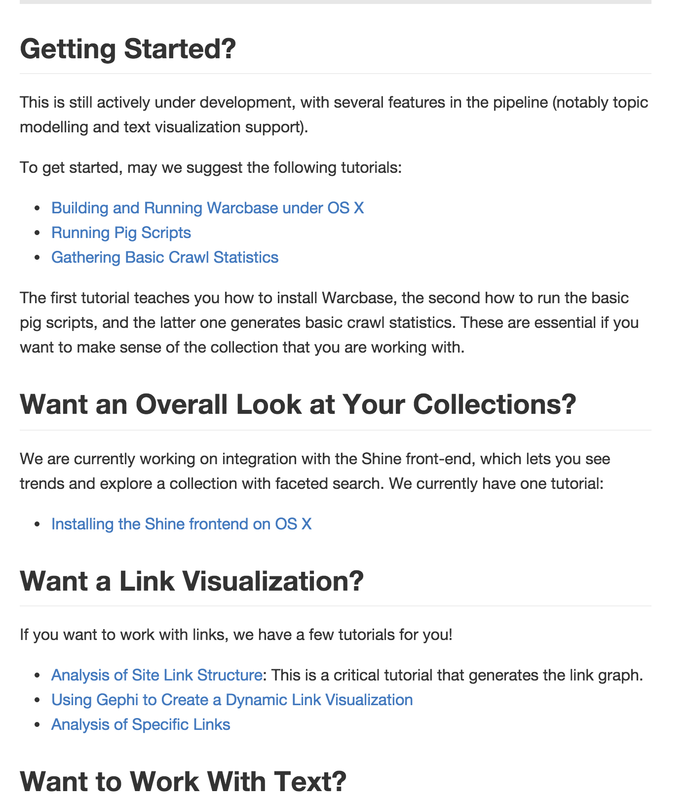 Want Link and Text Analysis? The Warcbase wiki in action! The Web Archives for Historical Research Group has been busy: working on getting the Shine front end running on Archive-It collections (a soft launch is underway here if you want to play with old Canadian websites), setting up Warcbase on our collections, and digging manually through the GeoCities torrent for close readings of various neighbourhoods. One collaboration has been really fruitful. Working with Jimmy Lin, a computer scientist who has just joined the University of Waterloo’s David Cheriton School of Computer Science, we’ve been working on scripts, workflows, and implementations of his warcbase platform. Visit the warcbase wiki here. Interdisciplinary collaboration is amazing! 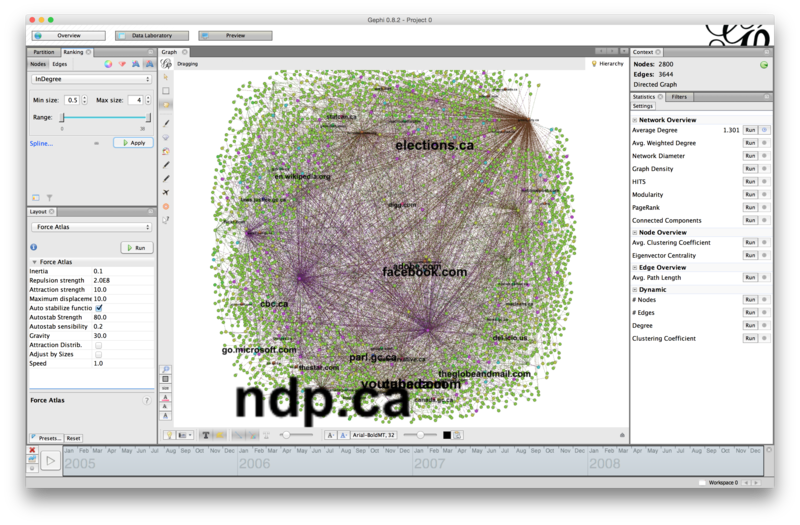 And basic n-gram-style navigation to monitor and explore change over time. All of this is relatively easy for web archive experts to do, but still difficult for endusers. The Warcbase wiki, still under development, aims to fix that. Please visit, comment, fork, and we hope to develop it alongside all of you. I normally work on properly dead people of the sort that do not really appear in the UK Web Archive – most of them eighteenth-century beggars and criminals. And in many respects the object of study for people like me – interlocutors of the long dead – has not changed that much in the last twenty years. For most of us, the ‘object of study’ remains text. Of course the ‘digital’ and the online has changed the nature of that text. How we find things – the conundrums of search – that in turn shape the questions we ask – has been transformed by digitisation. And a series of new conundrums have been added to all the old ones – does, for instance, ‘big data’ and new forms of visualisation, imply a new ‘open eyed’ interrogation of data? Are we being subtly encouraged to abandon older social science ‘models’, for something new? And if we are, should these new approaches take the form of ‘scientific’ interrogation, looking for ‘natural’ patterns – following the lead of the Culturomics movement; or perhaps take the form of a re-engagement with the longue durée – in answer to the pleas of the History Manifesto. Or perhaps we should be seeking a return to ‘close reading’ combined with a radical contextualisation – looking at the individual word, person, word and thing – in its wider context, preserving focus across the spectrum. And of course, the online and the digital also raises issues about history writing as a genre and form of publication. Open access, linked data, open data, the ‘crisis’ of the monograph, and the opportunities of multi-modal forms of publication, all challenge us to think again about the kind of writing we do, as a literary form. Why not do your PhD as a graphic novel? Why not insist on publishing the research data with your literary over-lay? Why not do something different? Why not self-publish? These are conundrums all – but conundrums largely of the ‘textual humanities’. Ironically, all these conundrums have not had much effect on the academy and the kind of scholarship the academy values. The world of academic writing is largely, and boringly, the same as it was thirty years ago. How we do it has changed, but what it looks like feels very familiar. But the born digital is different. Arguably, the sorts of things I do, history writing focused on the properly dead, looks ‘conservative’ because it necessarily engages with the categories of knowing that dominated the nineteenth and twentieth centuries – these were centuries of text, organised into libraries of books, and commentated on by cadres of increasingly professional historians. 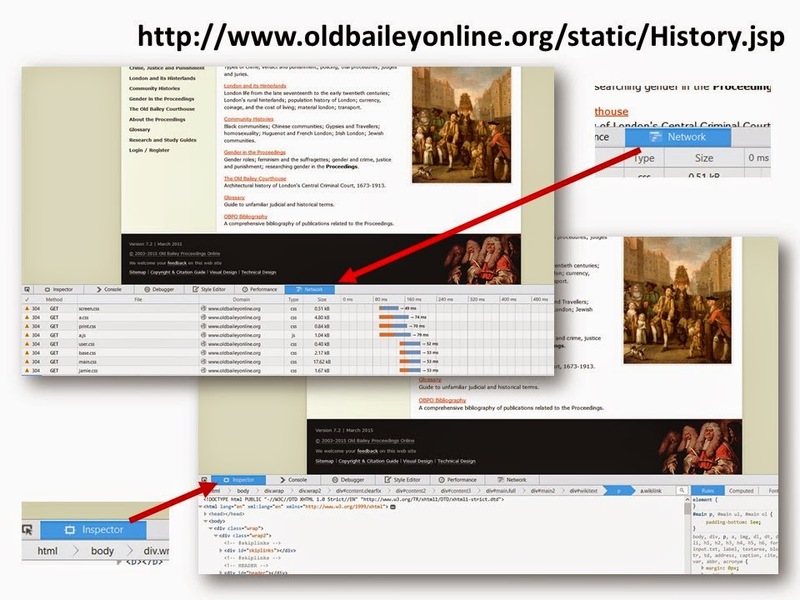 The born digital – and most importantly the UK web archive – is just different. It sings to a different tune, and demands different questions – and if anywhere is going to change practise, it should be here. Somewhat to my frustration, I don’t work on the web as an ‘object of study’ – and therefore feel uncertain about what it can answer and how its form is shaping the conversation; but I did want to suggest that the web itself and more particularly the UK Web Archive provides an opportunity to re-think what is possible, and to rethink what it is we are asking; how we might ask it, and to what purpose. And I suppose the way I want to frame this is to suggest that the web itself brings on to a single screen, a series of forms of data that can be subject to lots of different forms of analysis. A few years ago, when APIs were first being advocated as a component of web design, the comment that really struck me, was that the web itself is a form of API, and that by extension the Web Archive is subject to the same kind of ‘re-imagination’ and re-purposing that an API allows for a single site or source. As a result, you can – if you want – treat a web page as simple text – and apply all the tools of distant reading of text – that wonderful sense that millions of words can consumed in a single gulp. You can apply ‘topic modelling’, and Latent Semantic Analysis; or Word Frequency/Inverse Document Frequency measures. Or, even more simply; you can count words, and look for outliers – stare hard at the word on the web! But you can also go well beyond this. In performance art, in geography and archaeology, in music and linguistics, new forms of reading are emerging with each passing year that seem to me to significantly challenge our sense of the ‘object of study’ – both traditional text and web page. In part, this is simply a reflection of the fact that all our senses and measures are suddenly open to new forms of analysis and representation. When everything is digital – when all forms of stuff come to us down a single pipeline – everything can be read in a new way. millions of objects through 3d scanning; but we do not yet have an effective way of incorporating that 3d text into how we read the past. The same could be said of the aural – that weird world of sound on which we continually impose the order of language, music and meaning; but which is in fact a stream of sensations filtered through place and culture. 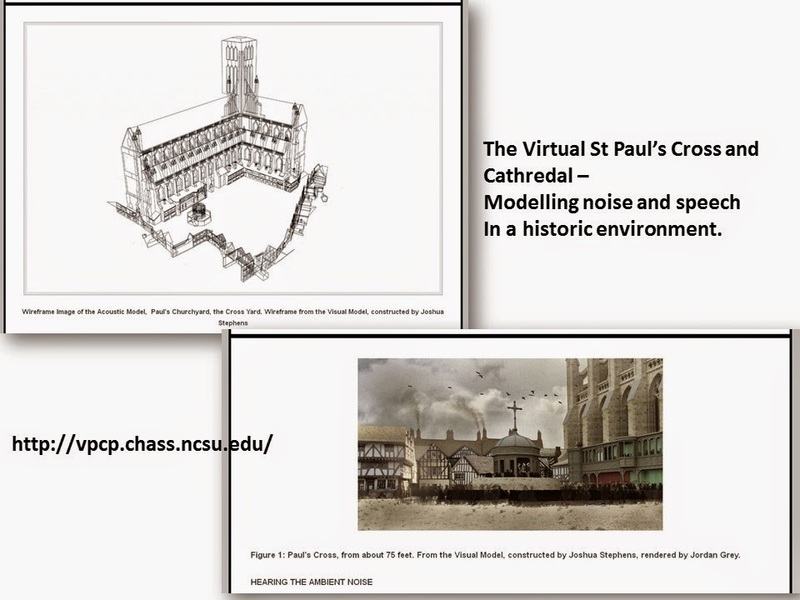 Projects like the Virtual St Paul’s Cross which allows you to ‘hear’ John Donne’s sermons from the 1620s, from different vantage points around the yard, changes how we imagine them, and moves from ‘text’ to something much more complex and powerful. And begins to navigate that normally unbridgeable space between text and the material world. And if you think about this in relation to music and speech online – you end up with something different on a massive scale. instance, effected your experience of transportation or imprisonment. And the point of the project is to simply add a few more variables to the ones we can securely derive from text. It is an attempt to add just a couple of more columns to a spreadsheet of almost infinite categories of knowing. And you could keep going – weather, sunlight, temperature, the presence of the smells and reeks of other bodies. Ever more layers to the sense of place. In part, this is what the gaming industries have been doing from the beginning, but it also becomes possible to turn that creativity on its head, and make it serve a different purpose. In the work of people such as Ian Gregory, we can see the beginnings of new ways of reading both the landscape, and the textual leavings of dead. 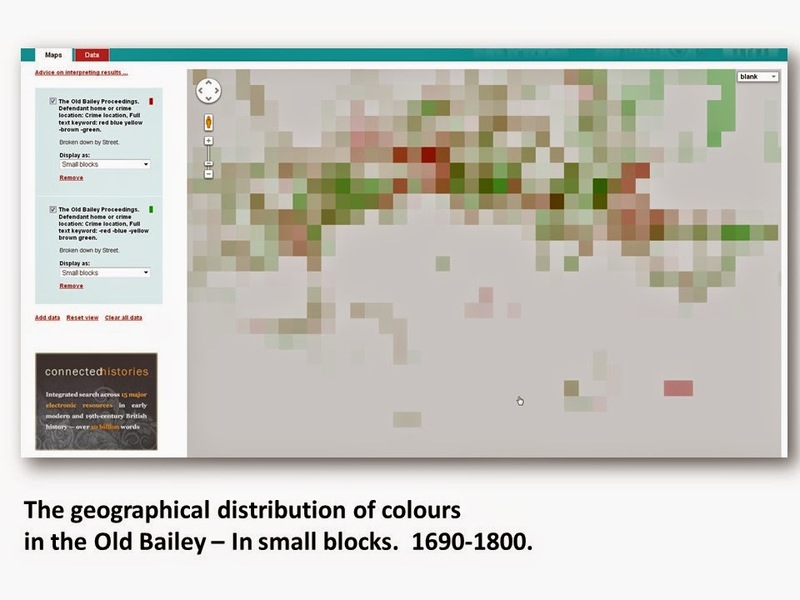 Bob Shoemaker, Matthew Davies and I (with a lot of other people) tried to do something similar with Old Bailey material, and the geography of London in the Locating London’s Past project. the text captured in the UK domain name. discover ever changing readings. But the Web Archive, challenges us to do a lot more; and to begin to unpick what you might start pulling together from this near infinite archive. remember that each component of the text – each word and letter, on a web page – is itself a complex composite. What happens when you divide text by font or font size; weight, colour, kerning, formatting etc. 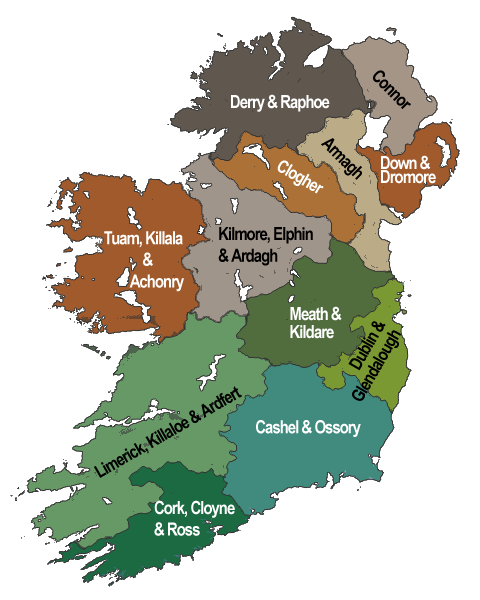 By location – in the header, or the body, or wherever the CSS sends it; or more subtly by where it appears to a users’ eye – in the middle of a line – or at the end. Suddenly, to all the forms of analysis we have associated with ‘distant reading’ there are five or six further columns in the spread sheet – five or six new variables to investigate in that ‘big data’ eye-opened sort of way. And that is just the text. The page itself is both a single image, and a collection of them – each with their own properties. And one of the great things that is coming out of image research is that we can begin to automate the process of analysing those screens as ‘images’. Colour, layout, face recognition etc. Each page, is suddenly ten images in one – all available as a new variable; a new column in the spreadsheet of analysis. And, of course, the same could be said of embedded audio and video. And all of that is before we even look under the bonnet. The code, the links, the meta data for each page – in part we can think of these as just another iteration of the text; but more imaginatively, we can think about it as more variables in the mix. But, of course, that in itself misunderstands the web and the Web Archive. The commonplace metaphor I have been using up till now is of a ‘page’ – and is the intellectual equivalent of skeumorphism – relying on material world metaphors to understand the online. an experience in real time. They do not exist until they are used – if a website in the forest is never accessed, it does not exists. The web archive therefore is not an archive of ‘objects’ in the traditional sense, but a snapshot from a moving film of possibilities. At its most abstract, what the UK Web Archive has done, is spirit in to being the very object it seeks to capture – and of course, we all know that in doing so, the capturing itself changes the object. Schrödinger’s cat may be alive or dead, but its box is definitely open, and we have visited our observations upon its content. So to add to all the layers of stuff that can fill your spreadsheet, there also needs to be columns for time and use; re-use and republication. 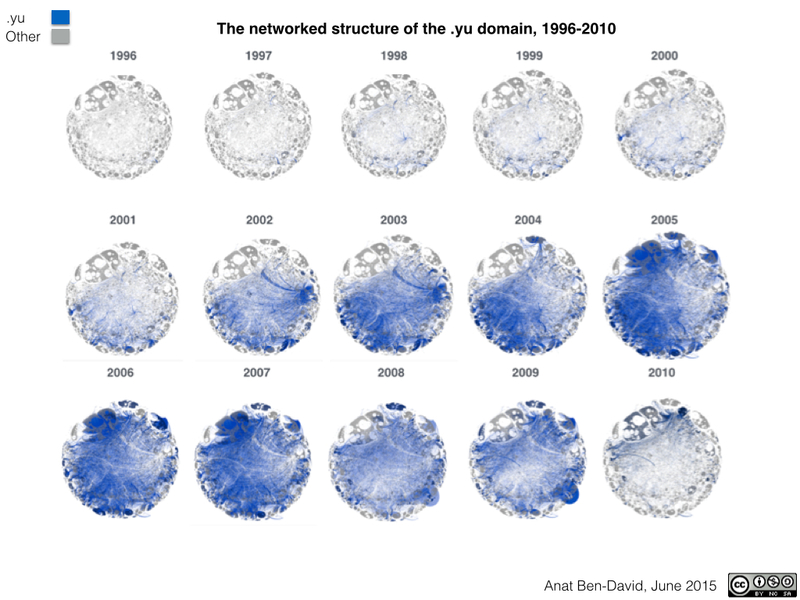 And all this is before we seek to change the metaphor and talk about networks of connections, instead of pages on a website. ‘object of study’ might be. In the nature of an archive, the UK Web Archive imagines itself as an ‘object of study’; created in the service of an imaginary scholar. The question it raises is how do we turn something we really can’t understand, cannot really capture as an object of study, to serious purpose? How do we think at one and the same time of the web as alive and dead, as code, text, and image – all in dynamic conversation one with the other. And even if we can hold all that at once, what is it we are asking?